Dow Extends Losses. And Gold? 600 points. Dow plunged so much yesterday. The S&P 500 and Nasdaq also suffered. The persistence of losses is disturbing. Should, then, gold shine? The stock market sell-off continues. Yesterday, the Dow Jones Industrial Average dropped more than 600 points. 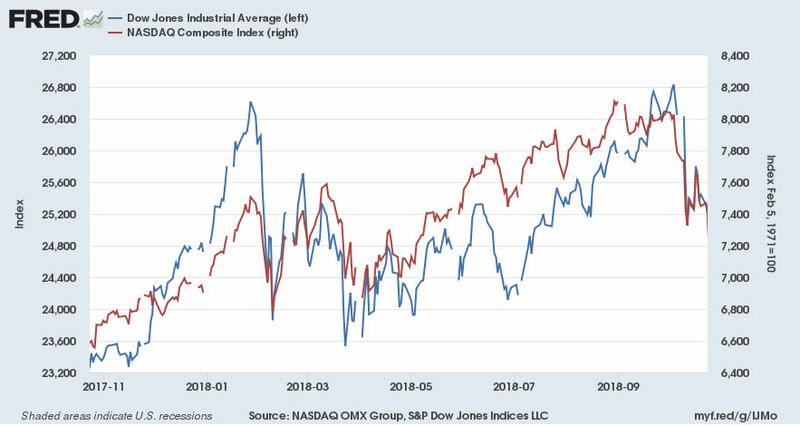 It means that the index erased all of its 2018 gains, as one can see in the chart below. Similarly, the S&P 500 fell more than 3 percent, turning negative for the year. In October, the index declined almost 9 percent, the worst monthly drop since February 2009. However, Nasdaq suffered the most on Wednesday, as it plunged 4.4 percent, marking the worst day since 2011. Chart 1: Dow Jones (blue line left axis) and Nasdaq (red line, right axis) over the last twelve months. So, why does the rout continue? The analysts point out that mixed corporate earnings and weak housing data (the new home sales plunged to the lowest level since December 2016) worried investors. However, what these commentators forget is that markets fluctuate and correct from time to time. The current sell-off is bad, but not as dramatic as the previous ones. In February 2018, we have seen the fastest correction since the 1950s, while in January 2016, when the S&P 500 plunged more than 10 percent in a few days after China devalued the yuan. Normal Correction or Something Bigger? What is really disturbing is the persistence of losses. The current sell-off is slower but steadier. What we mean here is the fact that the S&P 500 has declined in 12 of the last 14 days, while in the past we experienced more breaks between bad days. The last time we saw something similar was March 2009. Has the bear market started? Are we headed for another financial crisis and recession? Well, it is possible. The Fed has raised federal funds rate eight times in the current tightening cycle, after all. And historically, when monetary policy tightened, it never ended well. The correction is, thus, perfectly understandable. The interest rates were too low for too long, so the asset prices have grown too much. Moreover, with Powell as the new Fed Chair, the US central bank is a less reliable backstop for liquidity. The new leader seems to be determined to normalize the monetary policy and Wall Street started to worry that there is no Powell-put for the stock market. To be sure, we do not believe that Powell will not react to the stock market sell-off at all (especially given the dependence on the wealth effect), but he might be less responsive than Greenspan, Bernanke or Yellen. What does it all mean for the gold market? The liquidation of stocks caused investors to turn to safe-havens. So far, both the US dollar and gold benefited from this flight to safety. 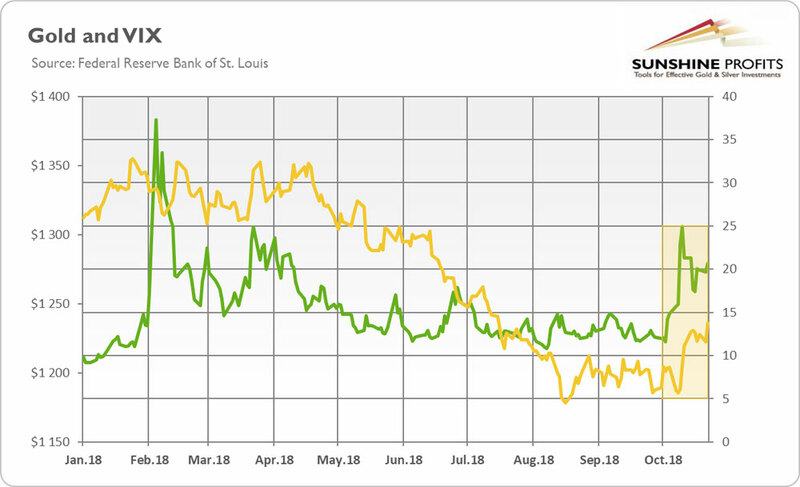 As one can see in the next chart, the price of the yellow metal jumped about 4 percent in October, returning above the $1,200 level. Given the previous extreme negative sentiment, the rally in gold during the increased volatility in the stock market (see the chart below) is not surprising. 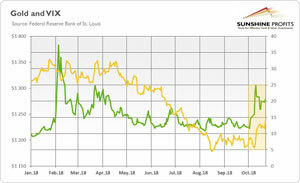 Chart 2: Gold prices (yellow line, left axis) and CBOE VIX index (green line, right axis) in 2018. However, will it last? We are skeptical. The new home sales may rebound in the next months (as the drop in September might in part result from the Hurricane Michael), and the Fed is likely to stay on course of gradual hiking. The US economic growth will slow down as the fiscal and monetary stimulus diminishes, but it will not halt. Inflation should remain contained, while the greenback is likely to remain the best choice among major fiat currencies. 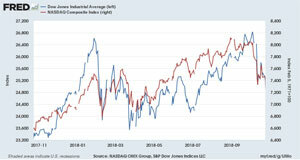 The financial markets are repricing right now, given the changed macroeconomic conditions, but solid earnings should come to the rescue, as income growth for companies included in S&P 500 is forecasted to be among the highest of the bull market. So the stock market sell-off does not seem to result from fundamental factors. Hence, the fundamental outlook for gold remains not very favorable. But we can see more volatility in the short-term, especially that Mario Draghi will hold a press conference today. Stay tuned!